We were unable to find any upcoming Chicago Blackhawks events. Chicago is the third largest city in the United States with its Chicago Metropolitan Area reputed to have over ten million people. Located in the heart of Illinois, this international business hub is famous for its sports teams chief among which is the ice hockey team; the Chicago Blackhawks. The Chicago Blackhawks are members of the Central Division of the Western Conference in the National Hockey League. Whether it's a trip on the cheap or a regular visit as a season ticket holder the Hawk's game is where the city's pulse is felt. They were founded on the first of May, 1926 as part of an expansion franchise into Chicago. Their traditional colors are red, black and white. The Hawks are principally owned by William Rockwell "Rocky" Wirtz who took over from his late father heralding a number of dynamic changes in the team's organization and structure. The team has recorded remarkable successes winning the Stanley Cup, Conference Championship, Presidents' trophy and Division Championship severally over the years. The name ‘‘ChicagoBlackhawks" is deeply rooted in history. It is said to have been influenced by prominent early owner Frederic McLaughlin. Frederic McLaughlin had been a commander in the first World War with the 333rd Machine Gun Battalion of the 86th infantry division who were aptly named the "Blackhawk division". The nickname given to the 86th Infantry Division was inspired by the exploits of a tribal chief known as "Black Hawk". He was a prominent figure of the Native American Sauk nation. As a leader Black Hawk is a very important personality in the history of Illinois and he has been honored with various statues and sites in recognition of his exploits as a band leader who rose to the position of war chief through daring raids and expeditions. The team was originally known as the "Black Hawks" with the name spelt as two words. This continued until 1986 when it was officially changed to "Blackhawks" in order to reflect the spelling found in the original franchise documents. The Blackhawks were the first National Hockey League team with an all American line up. This reflected the philosophy of then owner Frederic McLaughlin who led the way in promoting American hockey players which was a rarity in the world of professional hockey at that time. The Chicago Blackhawks team is famous for its affiliation and celebration of Native American culture with its logo being an adorned Native American head in a circle which has undergone several modifications from the crudely drawn black and white Native American head that was designed by Irene Castle, wife to Frederic McLaughlin. The team's mascot Tommy Hawk is also a popular figure. The mascot is adorned with the traditional Blackhawks four feathers on his head and is dressed in the Blackhawks jersey and hockey pants. The atmosphere at games is one of a kind and the Hawks have always managed to create an intimidating loud atmosphere. With tickets ranging from the very cheap to stepper priced tickets for a premium experience the ground is always full of teeming fans. The team is housed at the United Centre in a joint ownership with the Chicago Bulls. The centre replaced the Chicago stadium popularly dubbed the " Madhouse on Madison " which was in use from 1929 to 1994 With its practice of applauding and cheering loudly during the National anthem and its loyal fans who continue to buy tickets to fill the ground on game days the Hawks have continued to carve out an indelible niche in ice hockey. Check out the United Center seating chart. 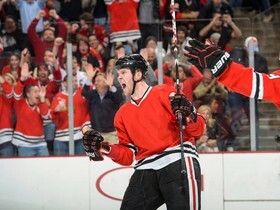 To learn more about Chicago Blackhawks tickets, before checking stubhub blackhawks or even craigslist, as well as other hockey games and sporting events visiting venues in your area, please visit CheapTicketsASAP.com for all of your sporting event info and cheap nhl ticket needs. We are happy to help make sure you don't miss any of the Chicago Blackhawks season games you want to see. CheapTicketsASAP.com acts as an intermediary between buyers and ticket sellers to facilitate the purchase and sale of Chicago Blackhawks tickets, and as such is not directly involved in the actual ticket sale transaction between the buyers and TICKET SELLERS. All sales are final. As tickets sold through CheapTicketsASAP.com are often obtained through the secondary market and prices are determined by the individual seller, the prices for tickets may be above or below face value. Chicago Blackhawks Tickets sold through CheapTicketsASAP.com are from a third party; therefore, the buyer's name will not be printed on the tickets. Tickets may be sent by email when stated so. Please note that the name on the tickets does not affect the buyer's ability to access the Chicago Blackhawks event.